PANMUNJOM, Joint Security Area -- The two Koreas’ militaries on Friday agreed to completely destroy guard posts in a front-line region by the end of November, as the two sides reiterated thier pledge to suspend all cross-border hostilities starting next month. At the general-level military talks held at the border village of Panmunjom, the two sides endorsed the comprehensive military agreement signed last month, in which the two Koreas’ defense chiefs agreed to cease all hostile acts on land, air and sea. The participants vowed to pull back troops and equipment from 22 guard posts inside the heavily fortified Demilitarized Zone. Once the posts are destroyed next month, the two sides will conduct mutual verification and complete the withdrawal process within this year. “I think the meeting is significant as we came up with a substantive and specific agreement to implement the inter-Korean military agreement,” South Korea’s chief delegate Gen. Kim Do-gyun told reporters after the meeting. “We continue to implement the agreement faithfully. Kim said the participants also agreed on “specific measures” to ensure free access to the Han River estuary running across the border region. The two sides pledged to conduct joint research on the water early next month. The meeting is the first of its kind since the two Koreas’ defense chiefs signed a comprehensive military pact after the summit between President Moon Jae-in and North Korean leader Kim Jong-un last month in Pyongyang. The inter-Korean military agreement includes the establishment of a massive buffer zone along the land and maritime borders, and a no-fly zone above the Demilitarized Zone and surrounding areas. The agreement said the measures would come into effect on Thursday. The two Koreas have since taken a series of highly symbolic measures to enhance mutual trust. Along with the US-led United Nations Command, they have withdrawn firearms and ammunition from the Joint Security Area inside the DMZ. “We have confirmed that the trilateral consultation between the two Koreas and UN Command and measures to demilitarize JSA are well underway,” the South Korean delegates said in a statement after the meeting. To accelerate cross-border military projects, the two sides agreed to establish a joint military committee “soon.” The committee was proposed after the two Koreas signed a comprehensive nonaggression agreement in 1992, but it failed to materialize due to the turbulent inter-Korean relations. 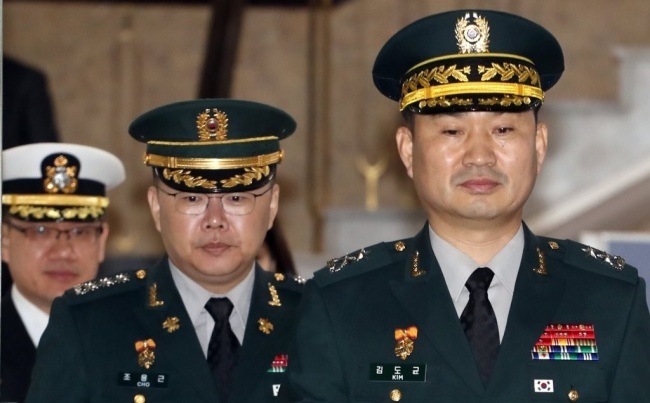 Defense officials said if the two Koreas’ militaries manage to agree on a launch schedule, the joint committee would serve as a permanent body for the two Koreas to take further confidence-building measures. “We had specific discussion” about the formation of a joint military committee, South Korean chief delegate Kim said. He added that the two Koreas agreed to refer to the 1992 agreement when it comes to the organization of the committee. Kim said the joint committee will be led by senior officials from the two Koreas ranking at or above the level of vice minister. The committee would comprise a chairman, vice chairman and five members. The general-level meeting began at about 10 a.m. in a North Korean building in the border village of Panmunjom. The five-member South Korean delegation drove across the border due to the heavy rain at the time. For previous talks, delegates had crossed the border on foot. The meeting started with the two Koreas’ chief delegates praising their militaries’ efforts to demilitarize the Joint Security Area. The Ministry of National Defense announced Thursday that the two Koreas had completed the withdrawal of firearms, ammunition and soldiers from JSA guard posts. “I’m really impressed by my firsthand look at the disarming measures in the Joint Security Area,” South Korea’s chief delegate Gen. Kim Do-gyun told his North Korean counterpart, Gen. An Ik-san, before the meeting started. Ahn echoed Kim’s remarks, saying the militaries deserved the credit for easing tensions on the Korean Peninsula by taking steps to disarm the JSA, the only place where the two Koreas’ soldiers stood face to face with their guns at the ready. “Until yesterday, we were at the forefront of clashes and confrontation, aiming guns at each other. Now we are grateful that we’re spearheading the efforts to achieve the goals of the two Koreas and uphold the leaders’ will,” Kim said.